The reason that working on your family tree can take so long is that there are a few challenging segments. If you are just beginning, be aware of the more difficult aspects to doing a family tree and if you have been at the search for awhile, don’t give up … most of the time there can be success. 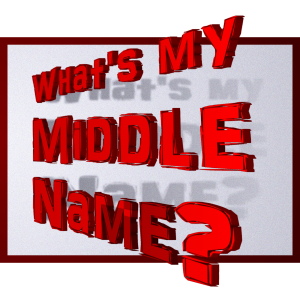 A Person’s Middle Name: Oh yes, that can be a challenge, either finding what the full middle is so you are not working solely without a middle name or only an initial. 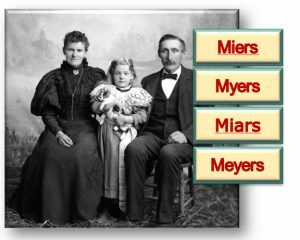 You need a middle name to help determine if you have the right ancestor. Just knowing the birth date and birth place is not enough. I have run across a person with the same month and year of birth from the same state and the only difference in the name was the middle name. Then you can have the problem of the person never been given a middle name, only a common first name and even a common surname. Now that can be difficult. Lastly with middle names are those individuals who only used their middle named and never their first given name. 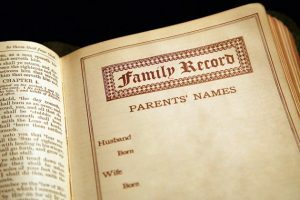 Misspellings or Change of Spellings of Names: Not just when an ancestor immigrated to American, their surname could have changed several times over the course of their life or their children’s lives. Here is an example of surname spellings changing. It is the Rue family from France who came to America in the 1830s. Here are the different spellings from the census records of the 19th century. It was not just the census taker getting different spelling but that spelling was located in other documents and records. The family just varied the name spelling. Of course, a name can be misspelled on any type of document, including census, marriage, deeds or Wills. Most of the time, if a surname is written in a family Bible, it does tend to be correct. First finding a female listed as Mrs. G. W. Springer is hard. You have the husband’s name but with initials. So start with him and get that settled first. Next working on the female’s given name is needed. Use Wills, city directories, deeds, and census records first. To get a hint of a maiden name, explain all the couple’s children’s names, their grandchildren and even great grandchildren (the descendants). Look for a first or middle name for these descendants, which were used by many families for a middle name. It has been a method of a mother’s maiden name to be carried on, but not used very often over the last 50 years. Also while going over census records, see if the mother’s mother or father, an unmarried sister, or a brother were living with the family or in a house next door. Also, check obituaries and see what was written. There could be a clue with the female’s parents listed or a surviving sibling. Use FamilyTree.com site of surnames. Here are hundreds of common and not so common family names. With each is where the name generally originates from, the various spellings of the name (VERY important to have), where in the USA most with the family name have lived, and lastly those celebrities who had that family name. Photos: Different spellings of the surname ‘Myers’; Family Bibles; and Middle Names.